I finally managed to find another Japan made Sigma, this time a 1980 Sigma DR-35. It’s a beautiful looking Martin D-35 copy with a 3-piece rosewood back. They are pretty hard to come by these early 1980’s Japan made Sigma’s and sometimes very expensive too, between 500-1500€ depending on the model. I didn’t buy this for myself, I’m way too happy with my Sigma DR-41 at the moment and on top of that I’m actually trying to thin out my Japanese guitar collection. I got it for my friend Wolf who just like me have gone from a pretty solid Gibson obsession to realise that perhaps that Martin sound is not that bad after all. There is something of that punchy mids and clear ringing highs in the Martin sound that these Japanese made Sigma’s have too, after all they were commissioned by C. F. Martin & Co. I thought my Sigma DR-41 was loud and had a very punchy midrange but this Sigma is one step beyond, I guess because of the 3-piece back. I like the highs and the overtones better in mine but still, this is an amazing sounding guitar that I thought long and hard about keeping for myself. I was sure that my Sigma DR-41 was made in 1982 since the serial number starts with E82 but since this Sigma DR-35’s serial number also starts with E82 and came with a receipt that proves that it was sold in September 1980 it must have been made that year, or earlier. This guitar had apparently been in storage for the last 30 years, since the original owner died and that seems plausible, it’s in really good shape for it’s age. The classic Made in Japan football stamp, burnt in to the back brace that was used from 1978-1983 on Japan made Sigma’s stating: Sigma Guitars – Made in Japan for – C.F. Martin & Co, just like on mySigma DR-41. The rosewood looks really nice on this Sigma, even better than on mine. Wolf asked me to install a LR Baggs iBeam in the Sigma before he received it and since I recently installed the LR Baggs Lyrics in my Sigma DR-41 it was a pretty easy task. We actually got to try them both out last Saturday when we played live with Cherry & Wolf at La Sonora, it sounded something like this. I did two tests to make it easier to compare the Sigma DR-35 with the iBeam to the Sigma DR-41 with the Lyrics. They both sounds pretty darn great, but in different ways. I have heard a lot of good, and some not so good, things about Sigma guitars over the years but never actually tried one. To be honest, I really didn’t know anything about the brand until this beautiful Sigma DR-41 arrived and I felt curious and started to read up on them. I guess one big reason why there are both avid supporters and fierce haters of Sigma could be the big changes in production over the past 45-years. The brand was Created in 1970 by C.F. Martin & Co as a line of inexpensive guitars to compete with all the far east brands that flooded the market at the time. The first generation of Sigma’s from 1970-76 were made in Japan but came with adjustable bridges and looks very inexpensive to me, I haven’t tried one so they might be great. When the second generation of Sigma’s arrived in the later half of the 1970’s they really started to look like Martin guitars and the build quality seems to have improved a lot, at least by the look of it. From around 1976-1984 Sigma produced the now classic DR-line, these guitars seems to be ridiculously collectable and very popular because you rarely see them up for sale. I have a feeling that most of them live somewhere in the US and are owned by middle aged men that bought them new as their first proper guitar around 1980 and since they still sounds really good they would never sell them. I have nothing against middle aged men or guitar hoarders, I’m 35 and an avid guitar hoarder and of course I still have the first guitar I bought back in 1993. I have had at least 20 different Japanese acoustics in my house over the last couple of years and this 1980 Sigma DR-41 is easily my favourite so far. The DR line consisted of DR-8, DR-9, DR-11, DR-14, DR-15, DR-28, DR-28S, SDR-28, DR-35, DR-41 and DR-45. I’m not entirely sure what DR-8 to DR-15 were based on, but DR-28 to DR-45 were pretty accurate copies of the Martin models with the same number. The guitar I’ve managed to find, the Sigma DR-41 looks very close to a Martin D-41 and I’ve seen pretty convincing Sigma versions of Martin D-28 and D-35’s too. Apparently there is a very rare version called Sigma DR-14, which is a DR-41 but with a 3-piece back, that was imported through Levin in Sweden, which makes sense since C.F. Martin & Co bought Levin in 1973. There are actually quite a few of the earlier 1970’s low end Sigma’s that were imported through Levin for the European market as well. It seems like the earlier Sigma guitars were made by Tokai through Kasunga Gakki but I really don’t know if all Japan made Sigma’s were produced by them or not. I have a feeling they might have used a lot of different factories during their 13 years in Japan. I couldn’t resist so of course I changed the machine heads for Wilkinson WJ28NGD as soon as I got the chance. I just can’t stand those big bulky Japanese 1970’s machine heads. Sigma stopped the production in Japan around 1983 and moved everything to Korea, later Taiwan and finally Indonesia. 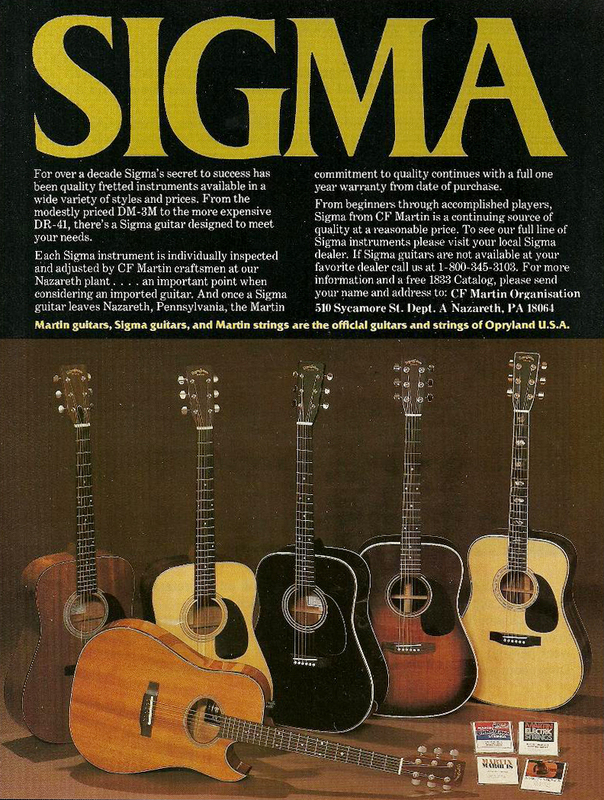 Martin claims that all Sigma’s where sent to them in Nazareth, Pennsylvania to be inspected and adjusted by Martin personnel before they sent them out to the dealers, which I doubt for the later Taiwan and Indonesian guitars. 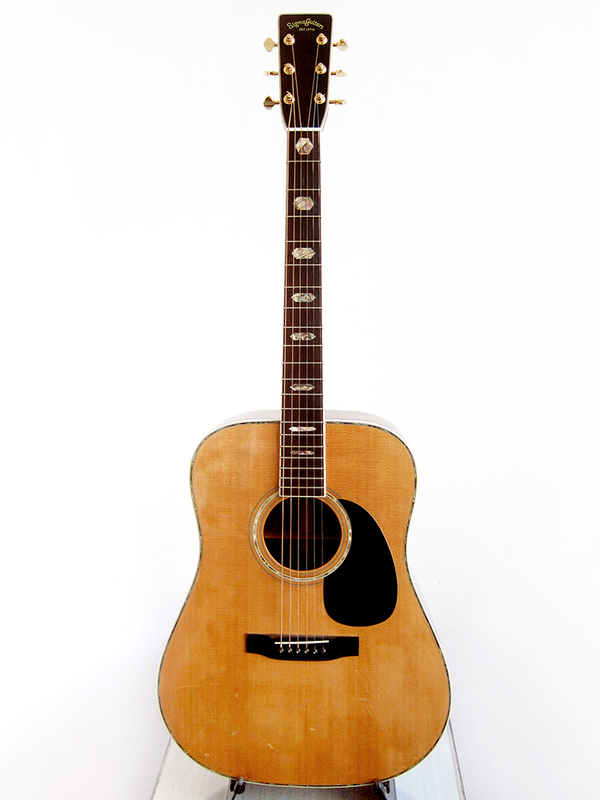 In 1981-1982, Martin imported partially assembled Sigma guitars from Japan and then put them together themselves in Nazareth, these were labelled Sigma Martin USA DR-28N and DR-35N. The Sigma story seems to be a bit shady from the 1990-2000, C.F. Martin & Co lost the rights to the name for a while and there seems to have been other companies producing Sigma guitars and then Martin got it back and closed it down in 2007. 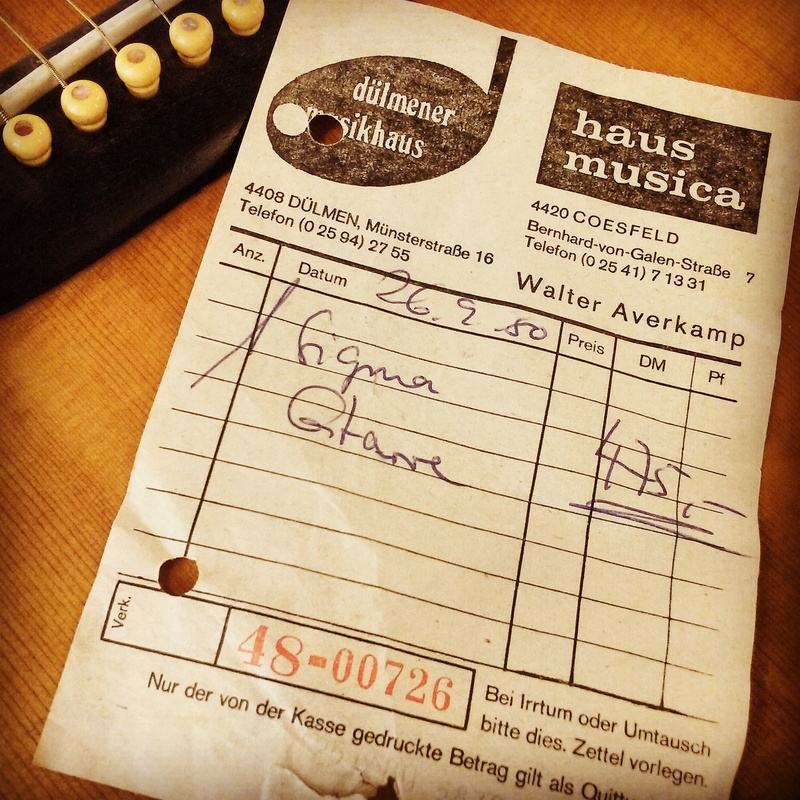 In 2011 the German company AMI Musical Instruments GmbH purchased the rights to the name and relaunched Sigma Guitars that are now being produced in China. There is quite a lot of information on Wikipedia about Japanese Sigma guitars. I also found this Sigma site really helpful. I really didn’t know what to expect when I got myself this Sigma DR-41. I just bought it because I’m so insanely gay for any guitar that looks like a Martin D-41 or D-45, or actually any guitar with a volute on the back of the head, hexagon markers and a lot of mother of pearl inlays. At first I didn’t like this Sigma much, I thought it sounded stiff and boring but after two days with the pump and a week of heavy playing I was sold. I’m not sure if all Japanese Sigma’s are this good, but this guitar is freaking amazing. It’s easily up there with Morris and K. Yairi, perhaps even better, see the second video where I compare it to my K. Yairi YW-1000.